Following the successful defeat of the German attack on Kursk (Operation Citadel) the Soviet High Command launched the Kutuzov counter-stroke - as planned. Model, the German commander responsible for the force attacking the northern shoulder of the Kursk salient immediately realised that the substantial number of units within the Orel bulge were at risk of encirclement. In particular the 9th Army - exhausted after having been fought to a stand-still in the Ponyri area. The 3rd Guards Tank Army launched an attack on an East/ West axis towards Orel on the 16th July 1943. Just five days later the Soviet 2nd Corps had taken the strategically important town of Otrada. In doing so the railway line to the German forces in the vicinity of Plavsk was cut. 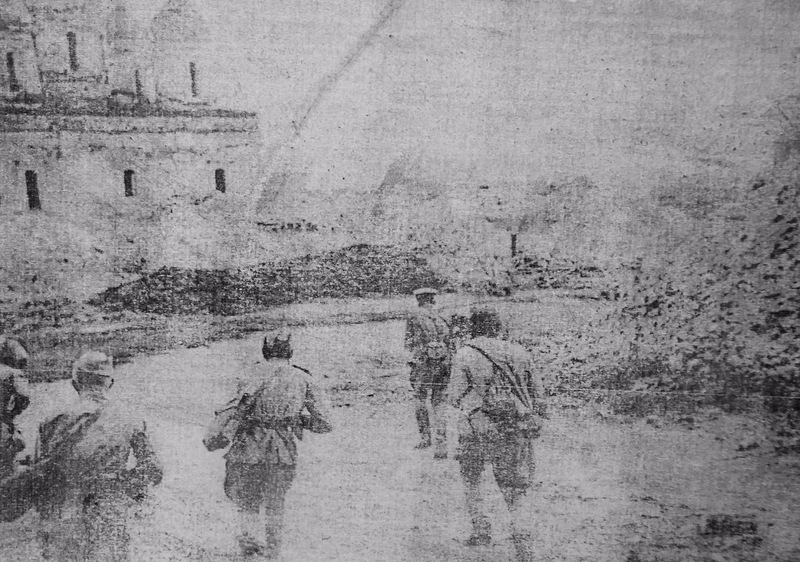 As the German panzers began to move back across the Oka river bridges in Orel city the situation began to look increasingly desperate for the Germans. Knowing that Bolkhov needed to be held in order to retain control of the north-eastern section of the battlefield and to facilitate an orderly withdrawal to the new constructed Hagen Line at the base of the Orel bulge, Model reorganised his command. Gruppe Harpe was an ad-hoc battle group consisting of the XLI, LII and XXII Corps. Amongst the forces committed to the newly formed battle group were the 9th and 20th Panzer Divisions. (Note: The blue building in the picture above is one of two such blocks built on the site of a wartime German cemetery in Bolkhov). Bolkhov is a beautiful town and we thoroughly enjoyed our stay in what appeared to be an old monastery. The town is dissected by the River Nugr (a tributory of the Oka) and whilst the main road bridge was rebuilt after the war, a second was not and is now marked by a rope bridge. Many of the churches in Bolkhov have been rebuilt and the golden domes are visible for many miles. We decided to walk the route of the German 20th Panzer Division which succesfully counter-attacked at the village of Wjasowaja on the 18th July. We also had every intention of getting to the villages of Betowo, Krasnikovo, Jatschnoje and Rylowo all of which saw heavy fighting involving the 9th and 20th Panzer Divisions during the third week in July 1943. The criticality of the sector to the Germans is evident in the fact that Model relieved General Scheller, Commander of the 9th Panzer Division on the 21st July for failing to execute a 'suicidal' night attack on Krasnikovo. The road from Bolkhov to Wjasowaja has a good surface and few potholes. En-route we spotted a number of small battlefield cemeteries. The village was revitalised in the 1970s for Russian emigres returning from Poland. Unfortunately few came and most of the buildings in the village are derelict. The picture above shows unfinished blocks which stand empty next to the few traditional houses inhabited by today's tiny and aging population. Unfortunately the end of the village meant the end of the metalled road. The routes through the forest to the other places we had intended to visit were very muddy tracks - many of which would be impassable even with a four wheeled drive vehicle. A villager and his wife had just returned from an exhausting trip - by horse and trailer - to the weekly market at Krasnikovo. Clearly the trip had been too much for them and for their horse. The 20th Panzer Division's War Diary for the 18th July 1943 reveals how difficult the fighting was in Wjasowaja. Kampfgruppe Demme (20th Pzr) launched an attack at 03:30 in the morning. By 6:05 the village was in German hands. Three Russian tanks broke through at 7:00 with another fifteen at 07:30. At 08:30 a German request for reinforcements was rejected. After heavy fighting through the afternoon, Demme consolidated his defending force on a line anchored on Hill 220.4 aided by 6 of the 20th Division's panzers. We visited two cemeteries in the village. The first is on a ridge overlooking the southern approaches. It's a contemporary battlefield plot with a private memorial to a Soviet Airman within the perimeter. The second is the village memorial and cemetery which can be found in the grounds of the local school. Both are carefully looked after by the local population. Our visit to the Bolkhov, Krasnikovo and Wjasowaja was considerably enhanced thanks to a terrific briefing pack prepared by my friend Martin Nevshemal, author of Objective Ponyri: The Defeat of XXXXI Panzerkorps at Ponyri Train Station (ISBN 978-0-9922749-1-7. The full photo set for Bolkhov can be found here on Flickr.